Build your strength in a TRX class, improve your cardio in a Row class and stretch it all in a Yoga class. Our multi-level classes are led by certified and motivating instructors and are designed to progress and regress the exercises. That’s fitness geek speak for it’s easy to adjust the exercises to suit any fitness level. Watch your distance off the tee increase and your scores on the links decrease as you participate in our Golf Performance Program. Our Titleist Performance Institute-trained instructors will conduct a full TPI assessment and fitness handicap analysis. 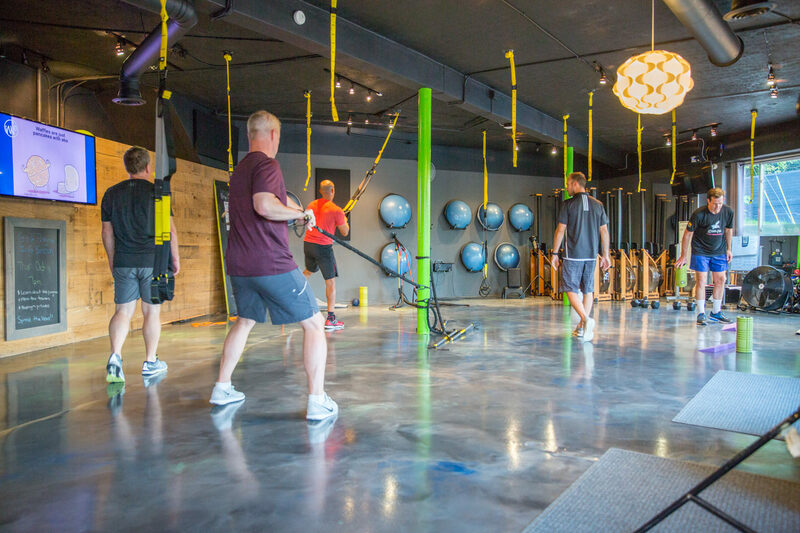 Group classes utilize the TRX, BOSU, Rip training and more to increase your flexibility and power on the golf course. Transform your body, achieve a sports-specific goal or just enjoy the completely individualized workout that a session with a personal trainer offers. We train real people, just like you, and we also work with high school sports teams. Our experienced and enthusiastic (sometimes too enthusiastic!) trainers will help you reach your fitness goals whether that’s completing your first marathon or fitting into last year’s jeans. "I have more energy, have shed some pounds, and shrunk my waistline from TRX classes. The expertise of all the trainers makes the time fly by as we are working hard with good tunes and burning calories! Thank you TRX!" "Pushing and praising at just the right time. My measurements were important to me, but more than that, I'm a happier person!" The place where Cincinnati goes for motivation, results and fun!